As this year’s All Hallows’ Eve approaches, rumours are rife that there’s a new cocktail in town that’s set to tear up the town with its stylish sensibilities. Well, folks, it’s true and the colour cocktail takes inspiration from the seasonal gourds of the moment. The Pumpkin Smash mixes up a refined palette of slate grey and gunmetal, with an added shot of spicy tangerine and pumpkin accents. For those who prefer their schemes on the calmer side, I would opt for a one shot version. However, for those who like to go all out on Halloween and in their decorating, you’ll want to order the triple shot version of The Smash. The stronger cocktail is made by accenting the elegant and refined grey notes with a heady mix of pumpkin-hued pendants, accessories and textiles. One shot or triple shot, this cocktail hits the right note for the season by bringing a welcome warmth to the cooler days. funny I was never a big fan on Halloween but now I maybe convinced thanks to your sophisticated take on this “trick or treat” season. Love that rug!! i just photographed an interior with the warm hues that fall brings, she had gourds on her mantel, they looked so good there. I'm lovin' the colour cocktail !!!! Ohhh, Tracey, that sounds like a great home to shoot! Thanks for stopping by! I love this color scheme! Gray with orange is unexpected but I love the look of it. I agree, Jacqueline! 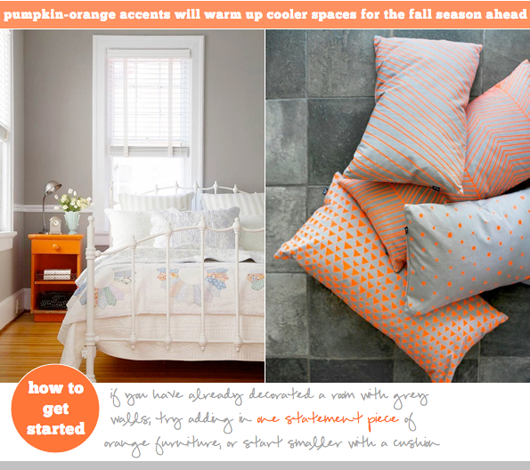 I like how you can switch up the feeling of the space by layering in more or less of the pumpkin accents. every time I read this column I want to use the cocktail of colors in my house … what can I do?? Great post dear Will! Would love to have that sofa…. Wow, orange matches so well with grey! Love your choices! and those pillows?!? striking! I love those cushions! Orange and grey is such a great combination. It's such a happy color! I will paint my front door some day in that color! for now, I am sticking to pumpkin comforters, cushions and throws. And, oh I loved that bedside table. Wow, they have a location in NYC. Gotta check out next time I visit. Just my kind of colour cocktail 😉 Great curation Will! 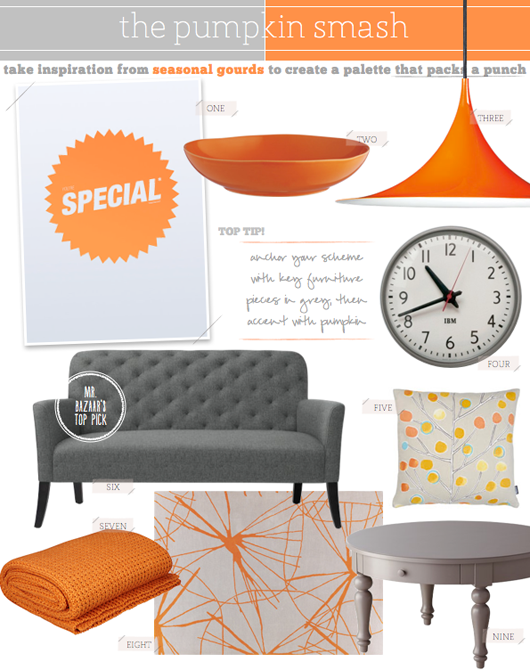 I don't normally gravitate towards orange, but when teamed with grey it has a whole new appeal! I once was at London during Halloween The streets were full with dressed up people #fun Enjoy ! Orange is such a statement colour love some of these little pops of colour! Have a fun filled Halloween Wil and a great weekend. I like your post even if i don't like orange! !I love the pillows!